Much has been written in praise of the riveting imagery and heartfelt humanitarianism of Ai WeiWei’s latest film, Human Flow, which is premiering in select US cities this month. The critical acclaim is well-warranted—aside from its aesthetic beauty, the film’s breadth is a feat in itself, drawn from years of reporting and over 900 hours of footage shot in 23 countries. It’s the Chinese dissident’s first full-length feature, an epic expansion on the themes of displacement that have informed his confrontational installations throughout Europe and the United States in recent years. At first, the film appears to be a conventional portrayal of the recent “migrant crisis,” opening with the now-familiar imagery of refugee-laden rafts approaching a Mediterranean shore, their iconic orange lifejackets stark against the frigid blue water. From this scene, however, the film unfolds further into both time and space, and toward a bolder, more political point. 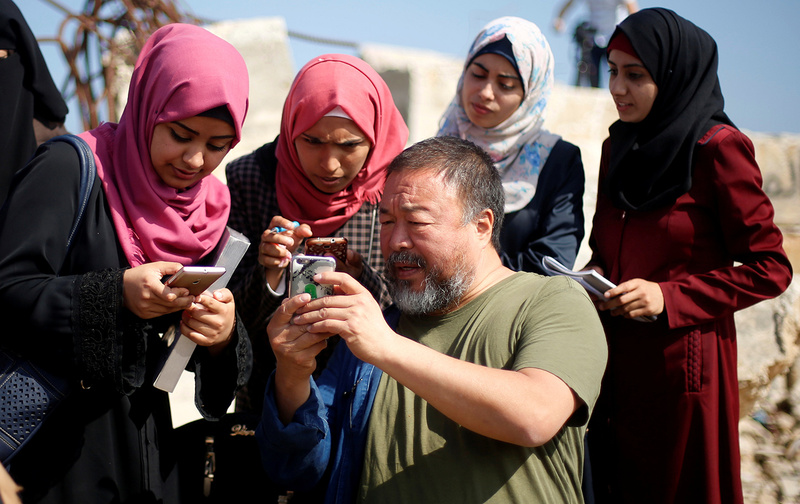 Alternating between the epic and the intimate, from mesmerizing aerial shots of mass migrations to iPhone footage of refugee men, women, and children, Ai WeiWei points to an interconnected, global moment. His editing is restrained, yet obviously sympathetic; he intersperses dynamic scenes with a series of living stills, his camera trained on one solitary migrant at a time. Each meets the camera’s gaze with the testimony of their particularity: a crooked belt, a whimsical squint, too-worn shoes. These are not statistics, the footage seems to exhort, these are human beings. Look. Keep looking. These scenes offer valuable contrast to an impersonal news cycle, but to be captivated only by the humanitarian spirit of Human Flow is to miss its deeper political implications. The film is, at its core, a strident indictment of the international community, and the West in particular. Ai WeiWei not only points to the bankruptcy of the global response to the refugee crisis, but also excavates the role of powerful nations in creating the conditions that led to this crisis. In ISIS-occupied Mosul, skies are blackened by the foul smoke of smoldering oil fields—an uncanny picture of the futility of the American invasion of Iraq. Sub-Saharan Africa, host to 26 percent of the world’s refugees, is shown ravaged by climate change caused mostly by distant, richer nations. In Pakistan, hundreds of thousands of Afghan refugees, already displaced by decades of intervention and war, are forcibly repatriated to a hostile land. The pressures caused by these and other man-made disasters send a cascade of millions toward the Global North, triggering the moment of moral and political reckoning that lies at the center of the film. In European capitals, leaders who rejoiced at the fall of the Iron Curtain issue orders for emergency barriers. Walls and razor-wire erupt along European borders. In one episode, thousands of exhausted refugees, trekking across Greece toward Germany, find the Macedonian border abruptly sealed by coiled metal and patrolling dogs. Undeterred—and with nowhere else to turn—the refugees camp out at the border, enduring cold winter rain in the shadow of passing, indifferent trains. A month later, desperate after so much waiting, the refugees begin to press against the barrier, only to be repelled by tear gas and rubber bullets. The camera lingers on a weeping toddler, gingerly touching his poisoned eyes, while an older man sits with an expression of tender regret. In its confrontation with the human flow, Europe is betraying its own principles upholding dignity, equality, and justice. In the end, the film’s primary argument might be summed up in the word magnitude. The average sojourn of a refugee is 26 years, we are told, and millions of lifetimes are today being lived out in a state of rootlessness and, often, extreme suffering. The walls, fences, and brute force currently used to control this tide are shown to be not only barbaric but futile. Our global proximity is now irreversible, and demands moral responsiblity. Our collective destruction or thriving are possibilities bound up in our ability to reckon with the fact that this “flow” cannot be simply staunched, or solved abstractly. The questions posed by this 65 million–person wave are inescapable, and inescapably human.